Whether you've spent a punishing day on the slopes or just long, lodge hours waiting for the apres-ski crew to roll in, indulge your laid-back lifestyle with the comfy Syrinx Ally Pants. Pull-on lounge pants in a flowing, palazzo silhouette. Silk-blend weave creates light, breathable performance in a super soft, smooth finish. Intricate allover print in an exploded paisley pattern. Encased elastic waist with tunnel drawstring. Medium: Size 4-10 / Waist: 26.5-29.5 / Length: 41.34" / Inseam: 39"
Large: Size 12-16 / Waist: 29.5-33.8 / Length: 41.73" / Inseam: 39"
X-Large: Size 18-16 / Waist: 33.8-38.6 / Length: 42.12" / Inseam: 39"
✅ Gorgeous and unique, these pants are a comfy treat. Featuring wide legs for a flowing, lean line, no matter what your body type. 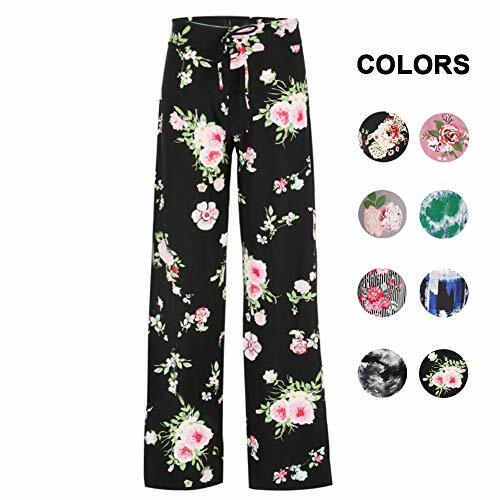 Whether you are running errands around town or simply heading out to check the mail, these wide-leg Palazzo pants will keep you feeling comfortable and looking stylish with every step. ✅ The drawstring waistband means you can wear them low or high and still feel held in at the waist. Home, travel, you will never want to take them off. ✅ Perfect for any occasions, such as casual wear, home wear, sleep wear, going out, yoga, vacation or beach wear. You can wear it in any season for different use. ✅ Size Chart: M: USA: 4-10, Waist: 26.5-29.5" Length: 41.34" Inseam: 39" ；L: USA: 12-16, Waist: 29.5-33.8" Length: 41.73" Inseam: 39" ；XL: USA: 18-16, Waist:: 33.8 ~ 38.6" Length: 42.12"Inseam: 39" . ✅ Note: There might be 2-3% difference according to manual measurement. Please check the measurement chart carefully before you buy the item. If you have any questions about this product by Syrinx, contact us by completing and submitting the form below. If you are looking for a specif part number, please include it with your message.